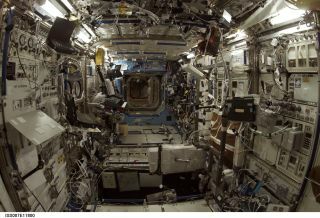 The Destiny laboratory on the International Space Station. Nowadays, most humans leaving Earth must do so through Russian territory. Space fliers ride on a Russian Soyuz spacecraft, which lifts off from a special parcel of Russian territory in Kazakhstan. Their spacecraft mission is commanded by a Russian citizen and a large chunk of their destination — the International Space Station — has modules and operations in Russian, too. This means that all astronauts going to the ISS, no matter how many languages they speak, also need to learn Russian. And astronauts and cosmonauts all over the world need to learn at least some English to work with NASA. English is a challenging language for foreigners to learn. How hard is Russian, anyway? The U.S. State Department's Foreign Service Institute has a scale for English speakers to understand the difficulty of learning another language. The department ranks Russian among several "Category II" languages, such as Greek, Icelandic and Croatian, with "significant linguistic and/or cultural differences from English. To reach a reasonable level of fluency in Russian, students can expect to spend 1,100 class hours — plus many hours of individual study time. That compares to between 575 and 600 hours for languages such as French, Spanish, Dutch and Afrikaans. Even astronauts speak about the Russian language's difficulty. Denmark's first astronaut, Andreas Mogensen, once said that learning Russian was his biggest challenge as he trained for an International Space Station mission. Former NASA astronaut Bonnie Dunbar also described the difficulties of learning Russian as she prepared to live on Russia's Mir space station. For her first six months of training, although "you knew the answer, you didn't know how to say it in Russian. For about six months, I felt like a small child," she said in an interview published on NASA's website. The NASA astronauts participating in Mir in the 1990s had varying levels of language training, and tended to do better with more exposure to Russian, said Megan Ansdell, a postdoctoral fellow in planetary sciences at the University of California, Berkeley. She wrote a 2012 Space Policy paper exploring the merits of an international language in space. "The astronauts often complained of insufficient language training, and all agreed that better Russian proficiency was necessary for safe operations on the Mir," she told Space.com by email. "Another issue was communication with ground crews, which only spoke English or Russian; this led to operational inefficiencies, such as the need to repeat multiple communications with ground crew or miscommunication of information when working through translators." But choosing another tongue to speak isn't all that simple. The ISS is governed in part by memorandums of agreement in which English is usually the operating language, although there are notable exceptions (such as when inside the Russian Soyuz spacecraft). Astronauts can operate in their native tongue in space when speaking with their own ground personnel, but they need to know at least enough English "to get by," said Michael Dodge, an assistant professor at the University of North Dakota who specializes in space law and policy. "Choosing an international space language could easily fall into one of two pathways. It could, for instance, become a thorny issue mired in geopolitical matters. Or, it could be much easier than one would think, as there are precedents in place already for a variety of space missions," he told Space.com by email. "There is already international precedent in the choosing of a single language for operational necessity, in both aviation and in space. In aviation, the ICAO [International Civil Aviation Organization] has already recommended, and since continued to study, the use of English as the so-called language of aviation. The reason behind this is that having all operators, from the ATC [air traffic control] personnel to pilots and onboard crew, all speaking the same language, increases their ability to do their jobs safely. There have been incidents where a language barrier has contributed to accidents and fatalities." Even if a location such as the ISS has an official language, it is OK to use other ones, he noted; several space law treaties (including the Outer Space Treaty and the Moon Agreement) say there are several equally valid legal languages for spaceflight. Dodge added that on the ISS, it's unlikely that if a new major participant came on board (such as China) that there would be a large change in language policy, mainly because of these safety reasons. But Chinese could be the language of choice in other situations, he said. On a Chinese-led Mars mission, for example, participation by other nations may include a requirement to speak in Mandarin or Cantonese. "Practically, however, with English being used already in cooperative international arrangements like the ISS, it feels most likely that it would be chosen for the language of space, in much the same way as it is for the language of aviation," Dodge said. While there is still a lot of debate about which language to use, Ansdell advocates talking to the astronauts to decide which language is best for safety as well as the comfort of the crew. As space crews move farther out in the solar system, they will feel more isolated and language will be even more important, she said. "One thing that struck me while looking back through these issues was the social aspect of language," Ansdell said. "Language clearly impacted crew integration: when you can't communicate sufficiently, you're isolated, and that's not a good thing on a long-term space mission to Mars. Also, the further you get from Earth, the longer the delay in communication back to the ground; this is a fact that we simply cannot get around, making it even more important for communication to be as efficient as possible."